If you can’t tell by now I LOVE slow cooker recipes. Like I mentioned in my last recipe for Slow Cooker Italian Sausage and Peppers I’ve not gotten on the Instant Pot slash Pressure Cooker train yet. I do have one but it doesn’t sit on my counter almost everyday like my Crock Pot does. Maybe I’m old school but I just prefer using my slow cooker over an pressure cooker. One day that may change but in the meantime I’ll stick to slow cooking. 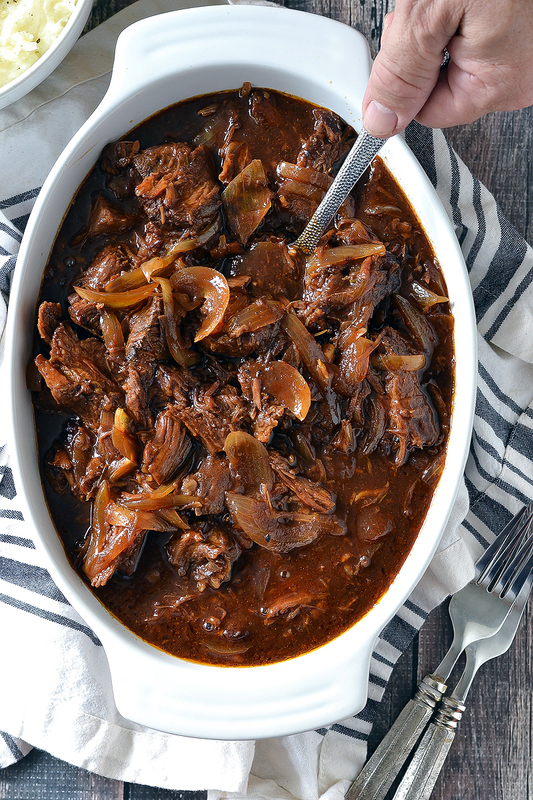 One thing I absolutely love to make in my slow cooker in a pot roast. If you’ve never tried a pot roast in the slow cooker you need to do so ASAP! 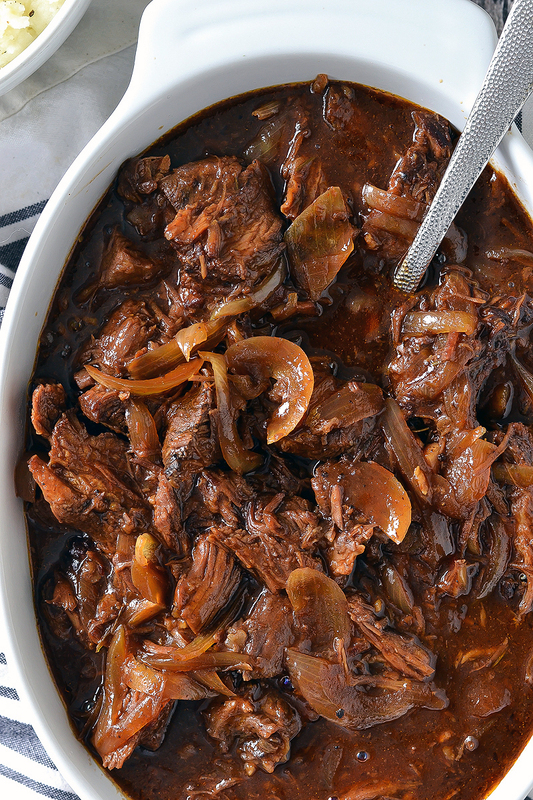 You can take a inexpensive chuck roast and make it so tender and juicy in the slow cooker. It’s the ultimate comfort food perfect for your fall and winter menus. This Slow Cooker BBQ Pot Roast couldn’t be any easier to make! 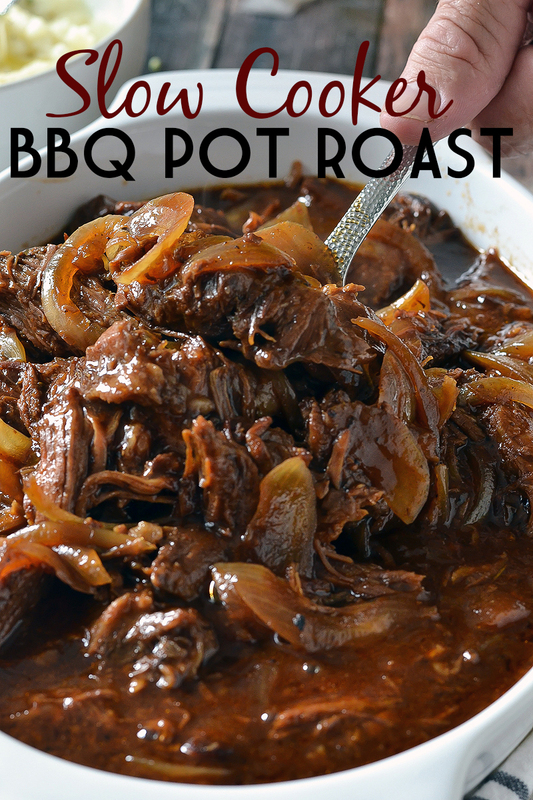 The end result is super tender and juicy BBQ pot roast that you can serve with a side of potatoes or even on hoagie rolls, buns or Texas Toast. Or just grab a fork and dig in! Thanks to a few supermarket shortcuts, this meal comes together in a snap. I use a simple bottle of store bought BBQ sauce. I do recommend a thicker one like a Sweet Baby Rays or similar, but pick your favorite. If you have a go-to BBQ sauce you use all the time, use it. I doctor it up with a few little extras like balsamic vinegar, rosemary and a dash or two of liquid smoke, a pantry staple in my house. Once you let this roast simmer all day, you’ll take off the lid and it will just fall apart once you put a fork in it. That’s my test to know it’s done. Then just shred it up however you’d like. Leave it chunky for more of a fork and knife meal or shred it good for tender and juicy BBQ Pot Roast on hoagie rolls, buns or even served on Texas Toast. Whatever way you serve it, it sure will be yummy! 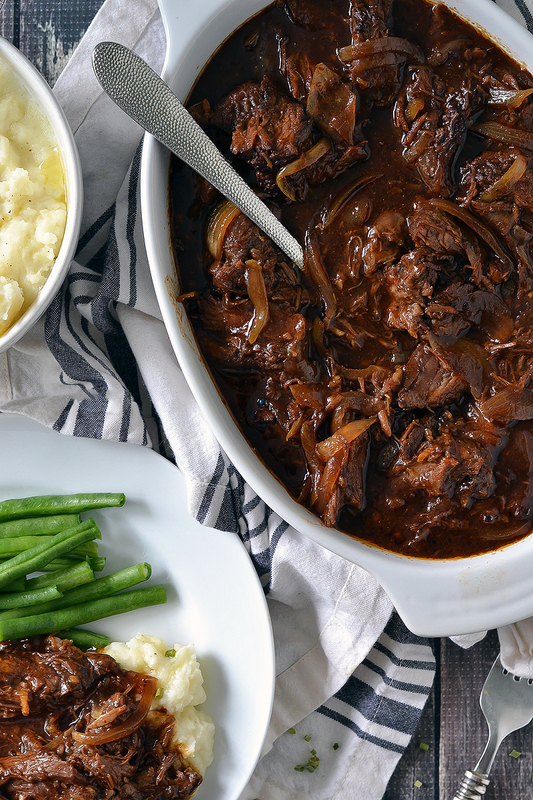 We’re celebrating Crock-tober all month long with tasty slow cooker recipes! Be sure to check out the Mother Thyme Facebook page for the current giveaway for a 5-1 Multi Slow Cooker. Giveaway ends October 13th! 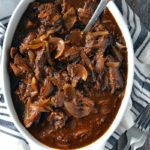 Place beef and onions in slow cooker. In a small bowl mix together BBQ sauce, balsamic vinegar, garlic, rosemary, liquid smoke and red pepper flakes. Pour sauce over roast and onions. Once beef is fork tender, carefully remove from slow cooker onto a cutting board and cut into pieces or pull apart with two forks. Stir slice/shredded beef back in sauce in the slow cooker and cook for a few minutes longer. Serve with mashed potatoes or on hoagie rolls, buns or on Texas Toast. Love your recipes! I’m a grandma once again cooking for a family. It would be most helpful if you included the number of servings.